Welcome to Local Job Board! Job seekers: LocalJobBoard.com is designed to help with your local job search by focusing your search on your own City or State. Other job boards have thousands of jobs, but only a fraction of those are actually jobs in your area. All of the jobs posted on LocalJobBoard.com are in categorized by City, State, and industry, allowing you to zero in on your perfect local job. We make every attempt to ensure the quality of our job postings, so you only see real, quality, local jobs. To ensure the best job search success, be sure to create a job alert and receive new local jobs every day via email. Employers: LocalJobBoard.com is designed to help you reach a large audience of local job seekers. We have the same technical advancements as the major job boards, but with a focus on local recruiting and at a fraction of the cost. If you want to find and hire people in your City or State, you've come to the right place. Post a new job today, and start receiving local resumes right away! See for yourself -- View All Cities with job postings! 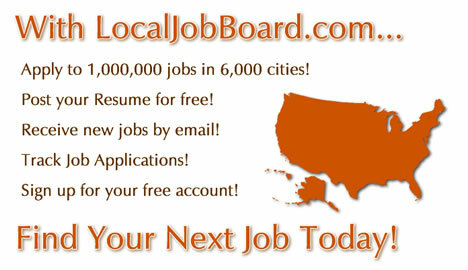 Local job search for 1,000,000 jobs in 7,000 Cities nationwide. Receive new jobs by email. Find your next job with LocalJobBoard.com.